Built in the late 1800s and previously used as Royal Navy base during the Second World War, The Caledonian Hotel is a historic building located in the resort town of Oban. The hotel is a 5-minute walk from Oban rail station and a 20-minute drive from the ferry terminal. Many rooms at The Caledonian come with views looking onto Oban Bay and the mountains of Mull and Ardgour. The Restaurant Caledonian is a Victorian dining room, which keeps its original charm with chandeliers and high-backed chairs. The menu offers traditional Scottish cuisine as well as modern European options. The Café Caledonian provides an all-day bistro menu and a wide variety of wines to enjoy whilst looking out onto Oban Bay. 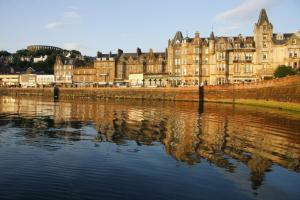 The hotel is located a minute’s walk from Oban Whisky Distillery which offers tours. The North Pier car park is open 24 hours a day and is just a 2-minute drive from the hotel.